Conceived for a radio show in the early 1930s, the characters of John Reid – soon to become the Lone Ranger – and his trusted sidekick Tonto soon transitioned to television, where they became American cultural staples. Since the series ended in the late 1950s, there’s been various attempts to bring the tenacious crime-fighting duo to the big screen, none more bizarre and erratic, yet somewhat thrilling than The Lone Ranger. John Reid (Armie Hammer), a handsome and idealistic lawyer who rides with the Texas Rangers in pursuit of ruthless criminal Butch Cavendish (William Fichtner), finds himself rescued by Tonto (Johnny Depp), a mysterious outlaw, after an ambush left him badly injured. Desperate to avenge his brothers death, John assumes the identity of masked vigilante the Lone Ranger and, with Tonto’s help, vows to stop the evil Cavendish in his tracks. From Disney and the team – director Gore Verbinski, producer Jerry Bruckheimer and star Depp – that took a theme park ride and turned it into the successful Pirates Of The Caribbean franchise, The Lone Ranger boasts many of the same problems that befell that series in its latter instalments: a bloated, and often exhausting, run time and several irrelevant sub plot that could easily have been trimmed had screenwriters Ted Elliot, Terry Rossio and Justin Haythe been more frugal. The film feels at its most tepid and erratic during its middle act when the narrative becomes nothing more than a mishmash of elements all sewn haphazardly together, with only a handful of them, mainly Helen Bonham Carter’s brief, yet inspired cameo as feisty madam Red Harrington, truly hitting the mark. It’s a relief, then, that the first and the third act are so packed with spirit, wit and satisfaction (the runaway train finale, in particular, is brilliant). That they’re underpinned by an oddly infectious screwball tone that tries its hardest to carry the film through even in its most troubling of states is even better. 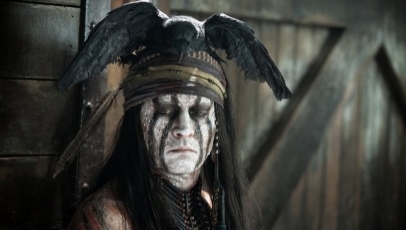 Likewise, Depp’s Tonto is different enough to his Jack Sparrow that he’s more than merely okay, and there’s decent turns from Fichtner, Tom Wilkinson as selfish rail tycoon Cole, who anchors one of the films sub plots, and Harry Treadaway, who exudes charm and hilarity as one of Cavendish’s cohorts. Sadly, none of the same can be said for Hammer, whose performance as John is quite frankly nondescript, and comes as another reason why the film doesn’t work as a cohesive whole. That said, not even Hammer’s poor efforts can make The Lone Ranger the wreck some people had it pegged as throughout its turbulent production period. There’s peculiar satisfaction to be had in Verbinski’s Western hodgepodge, though it often proves too much of a struggle to uncover it. Great review! The movie was definitely a mishmash of something. I love the site! They should have gotten rid of the flash-forward to the 1930s subplot. That took away any suspense that Tonto might be killed in the action. Unfortunately, it was a box office disaster, and we will never see a sequel. I thought Tonto was just as entertaining (and funny) as Captain Jack Sparrow.